This website was made the old fashion way (from scratch) using Visual Studio using C# and .net (DotNet) Web Forms. 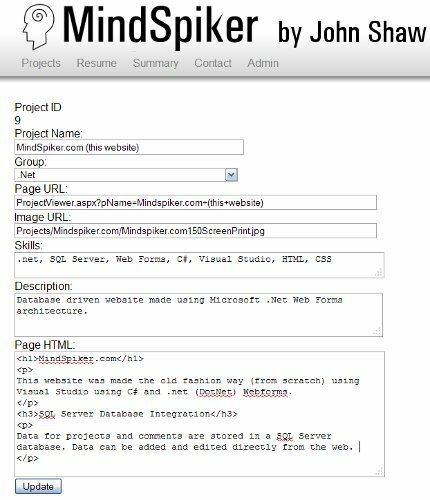 Data for projects and comments are stored in a SQL Server database and can be added and edited directly from the web. For HTML content to be keyed from a web form TextBox control the data needs special handling. Server side decode the HTML retrieved from the database using Server.HtmlDecode(myTextFromDB) then set the "Text" property of the TextBox to the decoded text. Server side; decode the HTML retrieved from the database using myDecodedHTML = Server.HtmlDecode(myTextFromDB) then create a literal control using new LiteralControl(myDecodedHTML ) then add it to the controls collection you want the HTML to appear in.